As he was incautious enough to say it to camera, we saw our foreign secretary on TV last night declare that it was "overwhelmingly likely" that the Russian president, Vladimir Putin, personally took the decision to use a nerve agent to attempt to kill the former double agent Sergei Skripal on UK soil. "We think it overwhelmingly likely that it was his [Putin's] decision to direct the use of a nerve agent on the streets of the UK, on the streets of Europe, for the first time since the second world war. That is why we are at odds with Russia", Johnson said. This means that a UK cabinet minister has personally accused the president of another sovereign state of attempted murder, "attempted" only in the sense that no one has yet died. It is not in any way possible that Johnson can have any evidence to support such a claim and, should he have had it, the place to make such a charge was not in the centre of a Battle of Britain museum display, as he played with the artefacts. This lacked the necessary gravitas and was wholly inappropriate. Should good evidence exist, then the proper place to air it would have been the despatch box in the House of Commons. A far better person to have made any charges would have been the prime minister. In that Mrs May has not moved swiftly to disown her foreign minister's statement, we must assume she supports his action, demonstrating that, with Mr Johnson, she is not fit for office. One need not refer to the Russian response. Such an action on the part of senior officers of the Crown displays an unacceptable lack of judgement. Yet, not only will these people remain in office – without the stinging rebukes that their action (and inaction) deserves - they are at the heart of our Brexit planning and delivery, and demonstrating the same dismal level of judgement in the execution of these tasks. And to add to Mrs May's dereliction – which goes far beyond the normal level of incompetence to which we have become accustomed – is yet another sin of omission, this one to remain silent after yesterday's absurd statement by Chris Grayling, another of her cabinet ministers. 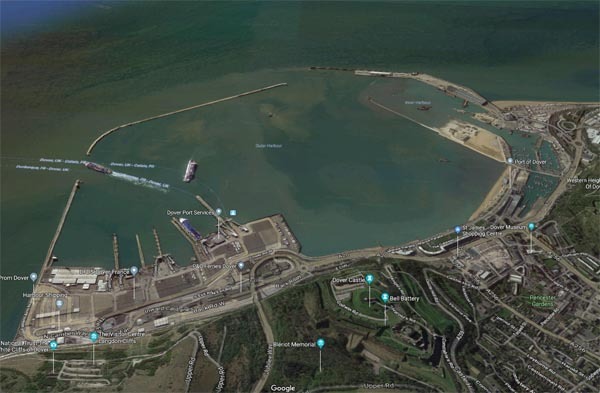 As we recorded yesterday, he told a BBC Question Time audience that: "We will maintain a free-flowing border at Dover, we will not impose checks at the port, it is utterly unrealistic to do so. We don't check lorries now, we're not going to be checking lorries in the future". In a situation which is difficult enough for businesses which have to plan for Brexit, this is equivalent to smacking a ten-ton boulder into a quiet boating lake on a balmy Sunday afternoon. In its own specific area, it points to a lack of judgement of the same order of magnitude as we got from Johnson. Unsurprisingly, Grayling's intervention has triggered a response from a number of MPs. In a letter to Mrs May, they have observed that the comments were "not a serious solution to how to manage the border post-Brexit". In all, 29 MPs have signed the letter, including former shadow cabinet ministers Chuka Umunna, Heidi Alexander and Chris Leslie, as well as fellow Labour MPs Rushanara Ali, Stella Creasy, Tulip Siddiq and Liz Kendall. But, in so doing, they display a not much better grasp of the issues than the minister they criticise. For instance, they declare: "It is extraordinary that a government that says it aims to ‘take back control’ now admits it is not even going to try to control the transfer of goods across our borders, in the event we leave the customs union", thereby demonstrating that they have no clear understanding of the role of a customs union, or the function of the Single Market. The worst of it though is that the letter carried the letterhead of the Freight Transport Association (FTA), with the principal signatory deputy chief executive, James Hookham. Rightly, he says that Grayling would have us "open up the UK's borders to potential abuse and breaches" and that the UK government would be unable to stop any new checks being imposed on the French side. He then avers that Grayling "seems to have forgotten that borders have two sides, and the UK cannot dictate what happens to freight when it reaches French customs". But, in a subject where the devil is in the detail, he then goes on to say that: "Mr Grayling cannot speak for the French customs authorities, which will be required by EU law to undertake a percentage of physical checks on cargo such as fresh produce or medicines from a nation outside the EU, which is what the UK will become". The correct term is "third country" and one wonders why it isn't used. And in asserting that a percentage of physical checks is required by EU law on cargo such as fresh produce or medicines, Hookham has got it wrong. He is conflating the "official controls" on animals and products of animal origin with other measures where there are no specific requirements. Generally, the frequency of inspection is decided by Member States on the basis of risk assessment. And, of course, the official controls are not the responsibility of customs. Once again, we see a failure to distinguish between different parts of the system – crucially important in this case, as the inspection of foodstuffs will require the infrastructure of Border Inspection Posts, with a lead time of many years. One would expect people such as Hookham, on the front line, to get such things right. But like so many in industry, as in politics, their knowledge is skin deep. Worryingly, they seem unconcerned by their own ignorance and show no willingness to remedy it. But when we have yet to see a single journalist display anything like an adequate grasp of the issues, it is unsurprising that there is no effort to get things right. A media which is content with any old tosh will get precisely what it expects. Every time a journalist dips in to the subject, we see woolly, incomplete and superficial attempts to describe the problem, but none of them ever get near. So we had yesterday the self-important Faisal Islam, flooding us with factoids to the extent that he ends up confusing himself and any readers incautious enough to rely on him. The SOP for journalists – typified by the likes of Islam – is to interview a number of talking heads and aggregate their ignorance to provide a narrative which will fill the allotted space. They (the journalists) have no means of judging the veracity of that they are told because they have no knowledge of their own or understanding of the issues. In this case, Islam relies on Christopher Snelling, also of the Freight Transport Association – the "go to" source with sufficient prestige for Channel 4's needs. Describing the "no deal" scenario, he tells us: "any goods going through will have to have checks, anything that is food or livestock or medicine will have even more checks on standards and health and all of that will be massively disruptive to businesses and consumers in Britain". To know that this is not wholly correct, all you have to do though is read the EU law or, to make it simpler, there are now 47 Notices to Stakeholders which set out the position. And, as we have written so many times, the immediate problem won't be inspections but marketing authorisation. As with meat and meat products (and animals), until the UK is formally approved and listed for export, there will be no movement of product at all. Any which is attempted will be returned or destroyed. One really has to ask what it is going to take to get this through to politicians and the media. But an insider view of the government system is not at all encouraging. The entire mandarin system, we are told, does not understand the law or ever read it. Even (or especially) senior civil servants do not understand the primacy of process in the way the EU does business - internally and with third countries - and we are being treated as a "soon-to-be third country". Not only are these critical mistakes, with potentially dire consequences, we have a class of mandarins that do not even know what they don't know. They neither know where to look nor how the thing really works from the inside, and do not have anyone left who does. The other side is, as a consequence, shredding them. Dominating the Whitehall tree of ignorance, is an overwhelming arrogance, imbued with an untouchable confidence that "we know best". They will not know they have been taken apart until it's too late, putting us in a bad state, politically and bureaucratically. We need some serious people. But they are in perilously short supply. As for the media, we have a more complex dynamic. Because they've all started out on the wrong foot, they don't want to admit their errors or the paucity of their earlier reports. And if they start now flagging up BIPs as a major issue, that opens them up to questions as to why others haven't been flagging up the problem (as in the trade or select committees). No one wants to be first. I've spoken myself to a lot of the trade people and their knowledge is distressingly limited. They have never experienced the regime pre-EEC/Single Market and have no conception of it. And they don't know the law. Everybody glibly talks about EU rules, but nobody actually reads them. Asked by journalists to describe the system, they convey not information but ignorance, And if they have sufficient prestige, the journalists lap it up uncritically. Another problem is conceptual. The journalists (as well as the rest) equate border controls with customs controls. They simply don't get it that customs are only a tiny part of the system. But knowledge of the rest of the system is minuscule, Their ignorance is profound and the knowledge gap is too great to bridge. They will have to find out the hard way. But, for their ignorance (and lack of judgement) – be it Russia or Brexit - it is us who will have to pay.